The U.S. Supreme Court's culvert decision was an important victory for Native American tribes in Washington state. The state must now spend as much as $2.4 billion to fix culverts—below-road channels that prevent salmon from swimming through and reaching their spawning grounds. Our program will explore tribal treaty rights, why the tribes sued over those rights and how the decision will affect Washington state and Kitsap County. 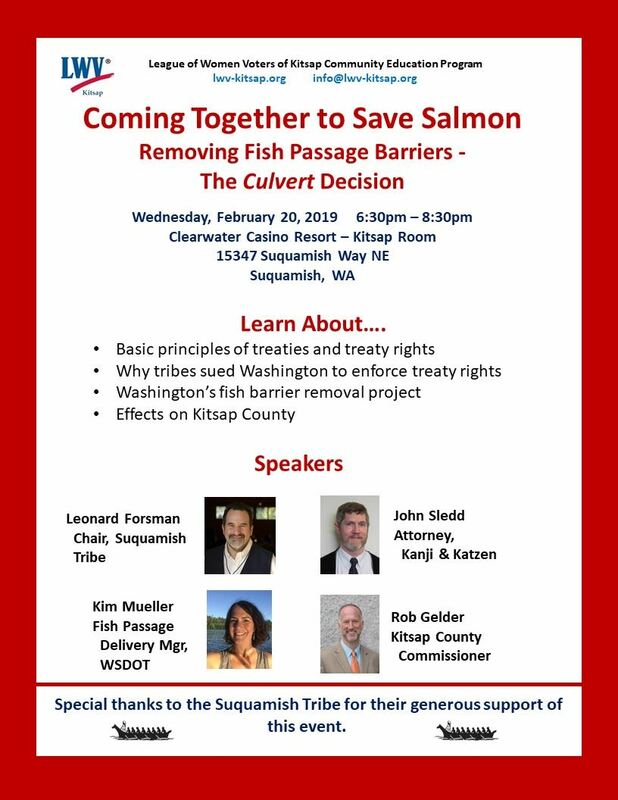 Our speakers include Suquamish Tribal Chairman Leonard Forsman, state Fish Passage Delivery Manager Kim Mueller, attorney John Sledd and Kitsap County Commissioner Rob Gelder.